Here is what I have found works well for us. Each suggestion might not be the one-all solves-all, but these strategies together have worked really well for us! 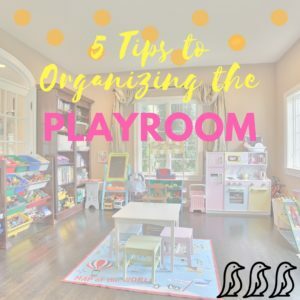 Level 1 – Picking Up – This is when the kids and I pick up all of their toys, put everything away in its place, and possibly give the room a quick vacuum and dusting. This is sufficient for day-to-day or week-to-week. Level 2 – Thorough Clean – I typically do this before any holiday, birthday, or event when I know new toys will be coming into the house. I also try to do this at least once every 2-3 months to maintain order and mix-up our layout. I warn my kids before I dive in and start this very serious task, and often require their help. They don’t really enjoy it, but they understand that it needs to be done. We will literally go through every single shelf, bin & basket. It is amazing how little toys and pieces can make their way into the wrong spot. And it is very frustrating when you want to play something specific and cannot find all of the parts. We also use this time re-organize the placement of everything. I like to visualize how my kids play with their toys. So I try to place everything that they might use together close by. An example would be their car mat rolled up next to the rack that holds the matchbox cars bin, and right near their bin of car tracks. Now, everything needed to play with cars is in one easy spot. 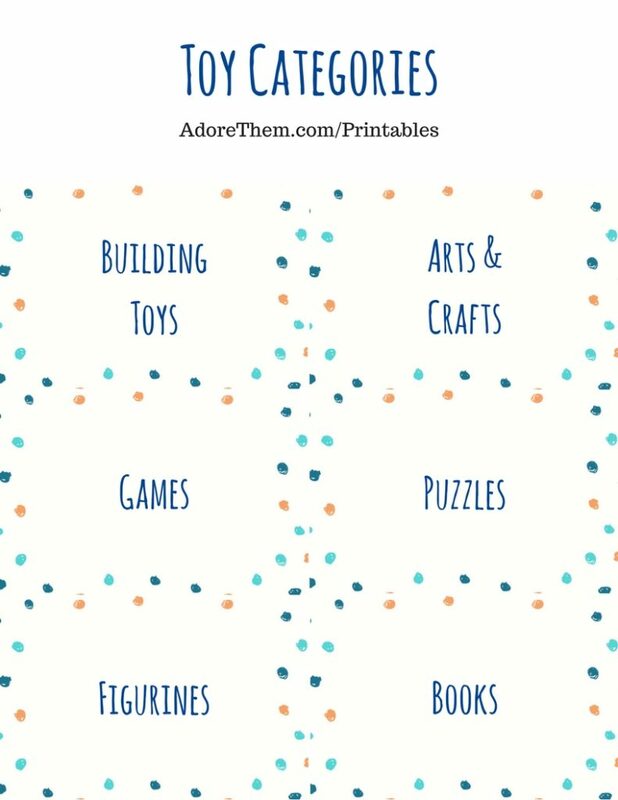 If it is before a birthday or holiday we discuss how new toys will be coming in, so we need to make some extra room. Because they are excitedly anticipating their new surprises, they are pretty good about saying goodbye to a few things in order to free up some space. I usually have an idea of what new toys my kids will be getting, so I keep that in mind when tackling this task. Of course kids want to play with their newest toys, so keeping that the focus really helps! Last year over Christmas I knew that our matchbox cars collection would be growing, but a lot of the bigger cars in the playroom were better suited for a younger age group. With that in mind, I cleaned out a lot of the cars to be passed on or donated, and upgraded the size bin that the matchbox cars currently lived in. This way after all the gift were opened, I knew there would already be a bin waiting for their new matchbox cars. 2. Storage Solutions – It is so important to give everything a designated place. Is it big enough to stand on its own? If not, then it needs a “house”. Think about how and when your kids will be playing with it. If it is frequently used and needs little adult oversight, then open bins and baskets work best on low shelves, on racks, or in cubbies. 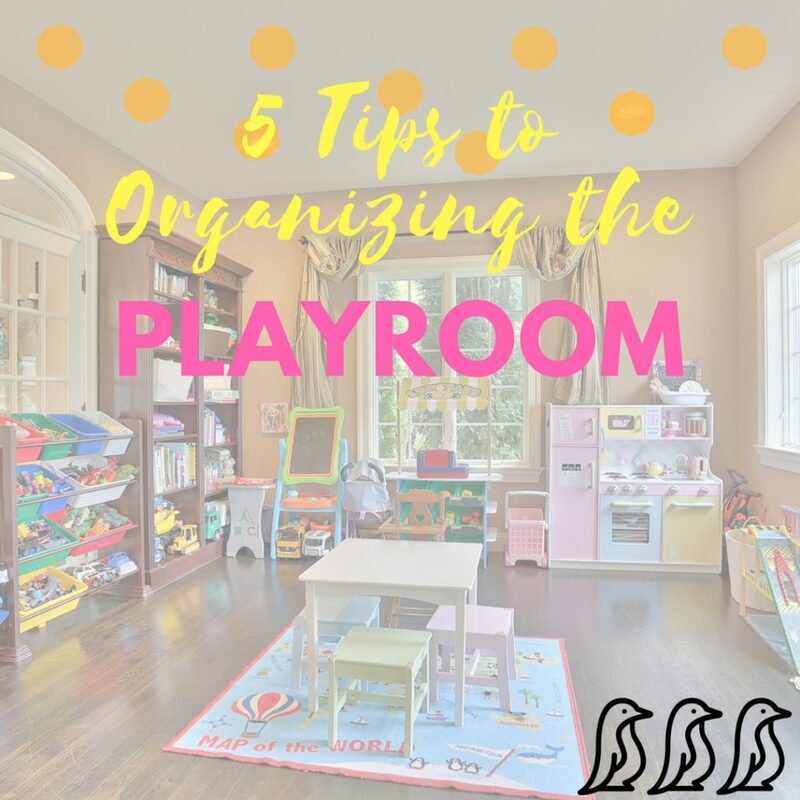 If it is something that requires adult supervision, or if it comes with lots of small pieces, consider placing it higher up on the shelves so that they need to ask an adult for help getting it down. This way you are alerted whenever these items are coming out. 3. Limit the Lids – Bins with lids may look nice and neat, but it amazes me how this 1 extra step can ruin our entire clean up process! Little kids often have trouble opening and closing lids properly, and older kids can even just be lazy about it. So often our bins end up looking disheveled as the lids get tossed around and even broken. Because of this, I try to use more totes and baskets. Plus their handles make it easier for the kids to pick up and carry around. What I save the lids for are for really small piece toys like legos, or something messy like play dough. If the legos were just in a basket and it spilled – that would have the potential to REALLY increase clean-up time, & result in lots of lost pieces. And the play dough always dries out so quick even in their little containers. So both of these things are kept in bins with lids and on top shelves – meaning they need to ask ME to help them get it out which also helps to avoid mishaps. 4. Get Involved & Get Creative – Sometimes children need a little guidance to get started. My boys love playing with their Lincoln Logs, but the logs typically do not keep their attention as long as some other toys. So one day I looked around their playroom for a little inspiration. I noticed their construction trucks were not getting much use. I waited for a day when I had a couple of projects around the house I wanted to be able to focus on and brought these items out together. (Incase you are wondering, we keep the Lincoln Logs in a bin with a lid, the larger construction trucks on a low shelf, and the smaller construction trucks in a big open tote with handles. This way the logs can’t spill, and the trucks are easy to grab). I suggested that we dump out the logs on one end of the room, and line up the trucks on the opposite side. Instantly the boys dove in. It took time and coordination to move the trucks across the floor, load up the logs, then find a spot to create a work zone. Eventually they had “construction sites” throughout the whole room. They ended up building a zoo, trucked in little animals, and layered their play with even more creativity – and I got to focus on my projects all afternoon – It was a win win for everyone! Sometimes I know you are in the middle of something and feel like you do not have the time to sit and play, get creative, or even deal with any interruptions – trust me, I know the feeling as I often feel this way since I work from home and have 3 young children. Gifting Experiences – I wrote an entire article focusing on this concept, but the summary is this – Last year I asked certain people to only give my children gifts of Experiences instead of Toys. It saved on the clutter, and my kids got to enjoy some really fun family outings because of it. Check out my Gifting Experiences article for ideas and the full story. 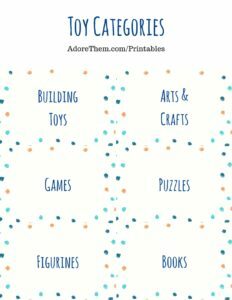 Gift Practicals – I think this becomes easier as your children get older and grow out of the toy phase, but you do not need to wait – it can be done with younger children too! I keep a list in my phone on the notes app all year-long. I make little notes to myself about things my kids ask for or comment on when we are out and about. Some of these items are toy related, but most are more practical. Recently we went on a trip and my son asked for his own tiger suitcase – not something I would have ever thought about while shopping for his birthday present – so I made a note. My daughter loves to color and draw. One time at Costco she spotted their enormous set of colored gel pens and freaked out – so I made a note. My kids love swimming all year-long, and one of their flippers recently got a tear – again, I made a note. These items may not end up being their favorite gifts, but I know they will love them and USE them! 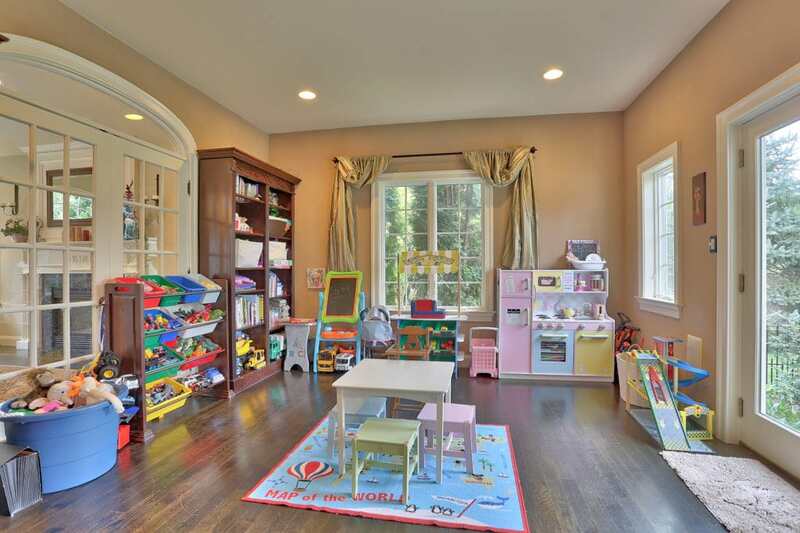 Our playroom changes layout and function every couple of months, but here is a picture from one of my layouts. By no means is this perfect, but it’s functional. You can see that the kitchen is beside the grocery/lemonade stand, and the big tote in font of it under the window is filled with extra kitchen food and accessories. The school desk is beside the easel, and on those book shelves are their books and accessories for playing teacher. The larger trucks stand alone (or else you could only fit one or two per bin) and the smaller vehicles are in those colored bins nearby. It’s hard to see but on the top shelves are jewelry making kits (in containers with lids) small farm toys, and a few other little crafts. I try to keep everything that is down low safe and easy for any little toddlers to play with on their own.